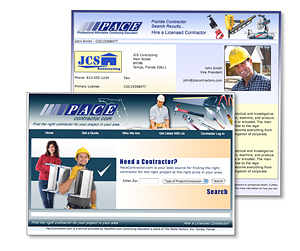 PacePDH.com’s free web site offer is for use by licensed contractors only. There are two options to choose from to enroll in our Web Site program. Purchase and take your continuing education with PacePDH.com and automatically enroll in our free Web Site program. Enroll in our Web Site program and pay a yearly maintenance fee of $50.00 (or $4.99 per month to be set up as a recurring monthly charge via Mastercard, Visa or American Express). This option entitles you to all other membership benefits afforded all other PacePDH.com members. CLICK HERE to get your non-member website. PaceContractor.com is a consumer web site designed for people looking to hire a licensed contractor. Your web site will be listed on PaceContractor.com and may be located by the consumer using simple search parameters such as zip code and area of expertise (type of contractor). These search parameters may be expanded or modified at any time without notice. PaceContractor.com will be aggressively promoted and marketed by The Media Factory, Inc via Google® and other reputable search engines. There are many ways to take your continuing education and still most contractors choose to go to seminars or take it with other online providers and that may never change. Those of you who take your CE with PacePDH.com, you are among the percentage of contractors who reap the rewards of the many benefits we offer. You have a distinct advantage over most other contractors by simply being a member. It is our mission to aggressively market PaceContractor.com to the consumer thereby giving our members a real boost with their marketing efforts. We understand the competitive nature of your business and how difficult and expensive it is to get exposure for your name. The internet is a powerful tool in today's economy and our goal is to make it much easier for the consumer to not only find you but to learn a little about you. Who know, perhaps even request a quote right there from their own computer. Unlike other web services, to find a contractor through PaceContractor.com is absolutely FREE. Why are we offering the website to non-members? Simple. We want non-members to eventually become members when they realize that we offer much more than continuing education. The more members we have the more consumers will use PaceContractor.com to find you. Everybody wins! Currently around 80% of all Florida contractors do not use the internet but attend seminars for their continuing education. If we can sign up a good part of the remaining 20% for this web site offer this has the potential to make PaceContractor.com the number one resource for consumers looking to hire a contractor. Don't miss out on this opportunity, sign up now. Though every effort will be made concerning our marketing efforts, absolutely no guarantees are made or implied that our marketing efforts, your web site and/or PaceContractor.com will assist you and/or your company in locating new customers or work of any kind anywhere.